Tennessee quarterback Zach Mettenberger believes he's earned the opportunity to start in 2015. But the Titans own the second overall pick in the draft, and might be lured into selecting a new signal caller. Every NFL team is looking for the next Andrew Luck or Peyton Manning, quarterbacks that are not only worthy of an early first-round selection because of the college resume, but also perform like it once drafted. But there are many draft land mines like Ryan Leaf and JaMarcus Russell to avoid, which makes being a quarterback-needy team at the top of the NFL draft such a scary proposition. Tampa Bay and Tennessee own the first two picks in the 2015 NFL draft, and both have a need for a quarterback. Washington (No. 5) and the New York Jets (No. 6) would also love the opportunity to grab a potential franchise quarterback. The problem is that there are only two quarterbacks worthy of high first-round picks: Marcus Mariota and Jameis Winston. With either on-the-field or off-field red flags, there are no guarantees that Mariota and Winston are more Manning than Leaf. What if the Titans weren’t forced to select in quarterback with their second overall pick in the draft? Tennessee grabbed quarterback Zach Mettenberger in the sixth round of the 2014 draft. He made a short rookie debut in Week 4 with a 2-for-5 performance including an interception, and was then moved into a starting role in Week 8. He only remained a starter for six games as a shoulder injury ended his season. Mettenberger completed 59.8 percent of his passes, threw for 1,412 yards (including a healthy 7.9 yards per attempt), tossed eight touchdown passes and seven picks. His 83.4 passer rating ranked 30th among passers with at least 100 attempts, and was the best of the 2014 rookie class. With only 179 passing attempts under his professional belt, no one is sure Mettenberger will develop into the franchise quarterback Tennessee needs. Titans head coach Ken Whisenhunt doesn’t want to rush that decision. "It’s an important decision for us, for the organization going forward, and I think that that’s one that we have time to make that decision," said Whisenhunt. "We’re going to go through that process and look at it. I’m sure in time we’ll come to the right one." Mettenberger believes he should be the starting quarterback in 2015. "I believe I have shown them enough, I just hope I’ve shown y’all enough to write good columns from here until next season," Mettenberger said after Tennessee’s Week 14 loss. "But I am confident in my abilities and what I have put on the field and what I have put on tape, and I think I have shown ownership, Ruston and the staff that I can play at a high level and I am going to continue to get better." If the Titans were to pass on their need at quarterback, they could trade this pick to another quarterback-needy team, or grab a defensive lineman that could alter games immediately. The Titans have 110 days until they’ll be forced to make a decision on Day 1 of the draft. 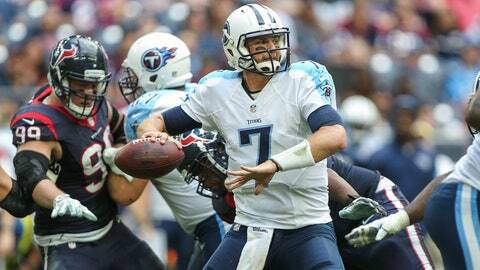 Grab either Mariota or Winston, or head into offseason workouts with Mettenberger as their guy. If Tennessee does pass on the two top-rated rookie passers, what might their draft plan become? At 2-14, there are plenty of needs outside of quarterback. Only five teams gave up more sacks in 2014 than Tennessee’s 50, so protecting Mettenberger would be an area to examine. 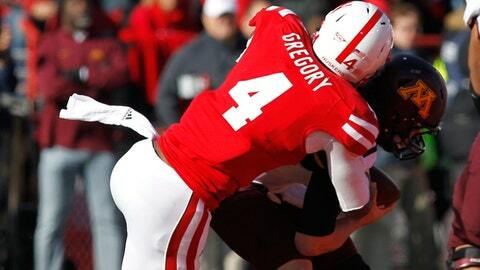 As would adding a pass-rusher or getting some help for the secondary. Of those three needs other than quarterback, only one is viable where Tennessee picks in the draft; a pass-rusher. It would be too early to draft either a corner or an offensive tackle with the second overall pick. At No. 2, however, three defensive linemen can immediately help as possible game changers for the Titans. Leonard Williams from USC, Randy Gregory from Nebraska and Shane Ray of Missouri. An equally intriguing idea for Tennessee might be to trade out of the No. 2 spot. The Titans might be able to pick up a few extra picks from the Redskins and Jets just a few slots below in the first round, or possibly even a mother lode from the Eagles at 20, where Mariota’s fit seems natural in Chip Kelly’s offense. Whether the Titans choose to grab a pass-rusher with their first-round selection at No. 2, or trade down to accumulate more picks, either way they’ll need to bring in a free-agent quarterback to push (read: add security) Mettenberger. With the current state of the franchise (Tennessee hasn’t posted a winning season since 2011 and is 15-33 over the last three seasons), adding extra draft picks by trading the second overall pick in the draft seems like a sound idea. And few would argue with the Titans for passing on Mariota or Winston to grab a guy like Williams, who is thought of as the highest-rated player on many draft boards. Unless the quarterback Tennessee passes on turns into the next Manning or Luck. But drafting with hindsight in mind is rarely a good plan.